This week’s Photohunt theme is hanging. Any guesses at what is hanging in the picture above? 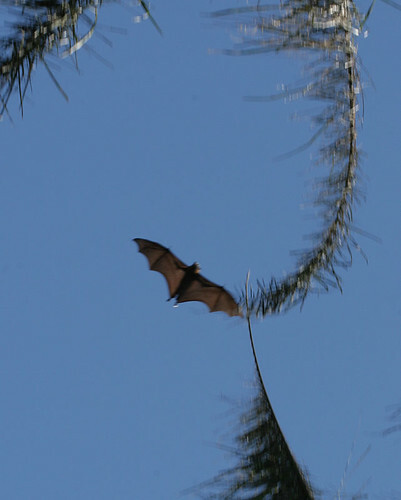 They are Flying Foxes, the largest fruit bat in Australia. These were hanging in a group of trees at the Sydney Botanical Garden. 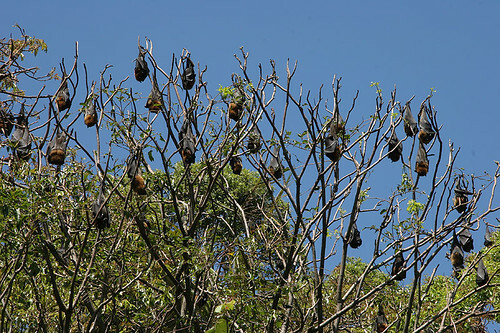 This group of over 2200 bats has ‘camped’ in the choice trees in the garden. 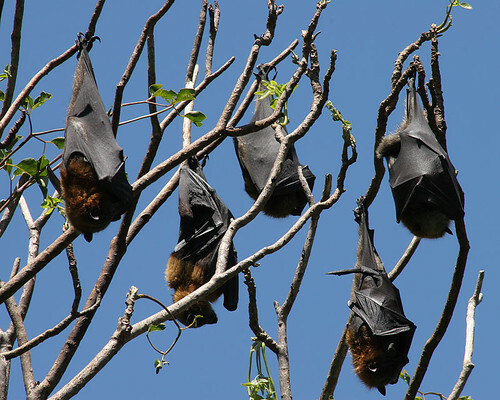 This protected species of fruit bat, the Grey-headed Flying-Fox, has the largest body of the of all bats During the day, they sleep hanging upside down. In the evening and night, they fly around feasting on nectar and fruit. They do create quite a mess, both in destroying the trees and their guano and urine below the trees where they ‘hang out’ during the day. The officials would like to get them to move but have been unable to come up with a way that is successful and will not hurt the animals. We found them fascinating. There were little tussles going on for space while they were sleeping. Occasionally one would stretch their wings or take off and fly. We watched them for as long as we could stand the stench. 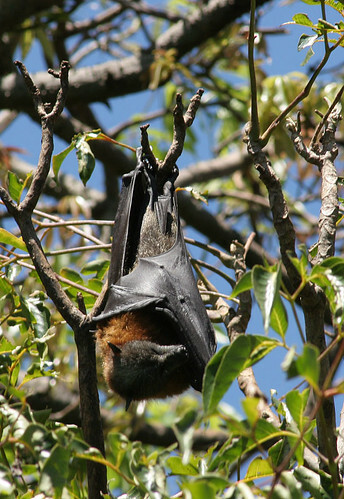 Here is a good article on the Flying Foxes of the Sydney Botanical Garden. With their wings wrapped around, they are like huge cocoons. Fascinating! Although creepy, in a way, also. Great pictures! great shots and a very interesting take on the theme. i don’t think i’ve seen anything like that before. thank you. Oh wow this is the closest and best bat photo that I have ever seen, really a good shot! Hi Marta, these are fabulous photos and a great take on the theme. I also liked that close-up shot. For some reason I wouldn’t have thought that they were furry. I also loved that one you captured flying off. Cool how you can see the body shape as he flys. Very interesting. Holy cow, that freaks me out to even look at them. Would not have been standing there near where they fly. Eek!! Hope you can drop by and see my take on the theme! wow, How fascinating. In the sunlight they almost look like they are wrapped in plastic. Great and perfect hanging. What a fascinating post and great shots for the theme. I’m not familiar with hanging foxes. I guess I should have known there were a different types of bats but I didn’t. What cool creatures. I hadn’t heard of them either. At first, I thought they were some kind of cocoon. I’m surprised to see how large the wingspan is. Thanks for introducing these guys! Wow! What an amazing creature! This is the first I’ve heard of them and thank you for sharing these great photos! What amazing photos and thanks for all the information. I’m sure the tourists love them, not. Even if they are interesting. Your live hanging foxes are much nicer to look at than the hanging fox in my photo hunt! I’m not sure if they ever got the project underway or not, but the bats were supposed to be relocated this past May through the use of loud music. The first colony of fly foxes arrived in the eastern suburbs of Adelaide a few months ago. I wonder if they will make it to the city center.